he war between Exiles and Angels is on — and she’s wanted by both sides. 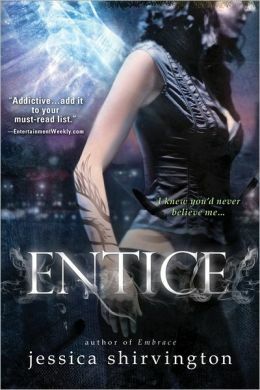 The hotly anticipated follow-up to Embrace, Entice ramps up the captivating combination of angel mythology, forbidden romance and intense action. Seventeen-year-old Violet Eden’s whole life changed when she discovered she is Grigori — part angel, part human. Her destiny is to protect humans from the vengeance of exiled angels. Knowing who to trust is key, but when Grigori reinforcements arrive, it becomes clear everyone is hiding something – even her partner, Lincoln. And now Violet has to learn to live with her feelings for him while they work together to stay alive and stop the exiles from discovering the key to destroy all Grigori. It isn’t easy. Especially when the electricity between her and exile Phoenix ignites, and she discovers his hold over her has become more dangerous than ever. The race halfway across the world to find the one artifact that could tilt the balance of power between Angels and Exiles brings them to the cradle of civilization, where Violet’s power will be pushed to the extreme. And the ultimate betrayal exposed. it was long awaited and certainly didn’t fail to deliver. This second installment of the series picked up right where we left off, it was post the big battle, Pheonix was gone and Vi was left to figure out what was going on in life and with Linc. Where i felt Embrace focused more on emotional relationships, Entice focused on the suspense and kept you on the edge of your seat. I found myself trying to figure out who was good who was evil, what exactly all the new folks introduced were and what role they would play. I love that the author brought Steph back into the mix as an important secondary character. In the first book we know that Vi lost touch with her a little bit because she felt that’s what she had to do, but Steph has proven that not only is she a great friend, she’s a really an asset to everyone. She can do what even the ‘gifted’ can’t and that proves to be incredibly useful. In addition to the main characters that we came to know in book 1 (Vi, Linc, Griffin etc), we are introduced to several new angel types that come from the New York Academy. There’s a partner pair that show Vi that what she’s still feeling about Linc can be possible if you’re willing to risk it, a partner pair that don’t quite click because of a language barrier and one who’s still waiting for his partner to embrace. it’s an interesting mix for sure, but they all prove to be essential. So this 2nd book takes us on a quest to find the Scriptures which are also under extreme desire by Phoenix. Phoenix won’t fail to keep you on your toes this whole book – you never know what his true intentions are aside from knowing that he wants the Scriptures but what else does he want? what are his true intentions. there’s a lot that happens, quite a bit that makes you happy but some things that just really irritate and piss you off. myself – i expected one of the pieces to the ending but a bit of it was a surprise. Jessica Shirvington continues to draw us in with her descriptive writing, taking us to geographical locations that we wouldn’t have thought about before. It’s actually nice to know that in other angel centric books that i’ve read, they all lead to relatively the same places in the world – so everyone’s on par with one another. In addition to how well she ‘shows’ us what the surroundings are like, we really do get to see a lot more into the interactions between everyone and delve a bit into their relationships. i think that at times it could have been taken a bit further, but perhaps it would have been to the detriment of the overall story. I can’t wait now for Emblaze to come out. the excerpt at the end of Entice got me really interested. This entry was posted in fantasy and tagged Angels, Emblaze, Embrace, Entice, exiles, Jessica Shirvinton by iscm13. Bookmark the permalink.